Ten Speed Press, 9781607742739, 272pp. 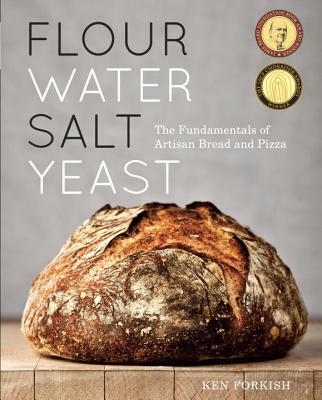 "Legendary Portland baker Ken Forkish (of the watershed Ken's Artisan Bakery and much-loved Ken's Artisan Pizza) has joined the ranks of the lauded letterers with his mammoth new cookbook Water Flour Salt Yeast: The Fundamentals of Artisan Bread and Pizza. In Water Flour Salt Yeast, he aims to bring the spirit and quality of his famous crusty, blistered breads to the passionate home baker using those four titular ingredients." "Forkish's instructions are clear, concise and incredibly precise... For true artisan bread lovers -- and homemade pizza fanatics -- this book sets a new standard." "Divided into four sections (“The Principles of Artisan Bread,” “Basic Bread Recipes,” “Levain Bread Recipes,” and “Pizza Recipes”), with recipes broken down by breads made with store-bought yeast, breads made with long-fermented simple doughs, and doughs made with pre-ferments, the book presents recipes accessible to novices, while providing a different approach for making dough to experienced bakers. Plenty of step-by-step photographs, along with a chapter outlining “Great Details for Bread and Pizza,” make this slim work a rival to any bread-baking tome. A variety of pizza recipes, including sweet potato and pear pizza and golden beets and duck breast “prosciutto” pizza, (along with an Oregon hazelnut butter cookie recipe), end the title and inspire readers to put on the apron and get out the flour."